As one travels throughout American communities, we are reminded of the tragic loss of life on 9/11 through plaques, monuments, and memorials. These tributes are set in bronze, marble, and stone throughout our train stations, shopping malls, workplaces, and community centers. They are sacramental reminders of lives gone too soon, whose memories must be eternally engraved into our hearts and souls. 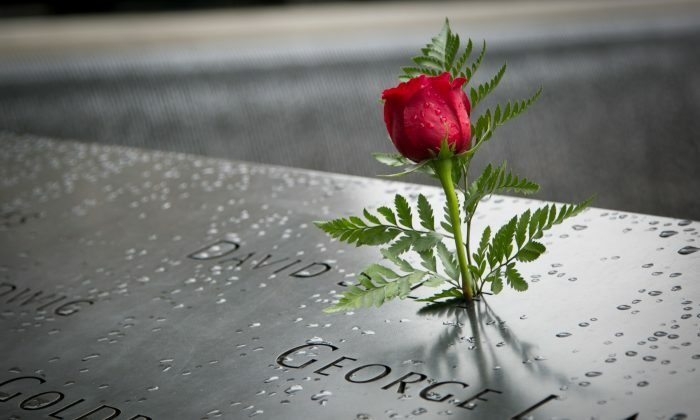 America will perpetually honor those who perished on 9/11, and we must be passionately dedicated to transforming our nation, as a fitting tribute to their memory. America will pause again on Patriot Day, Sunday, Sept. 11, 2016 to reverently observe the fifteenth anniversary of 9/11. This sacrosanct anniversary reminds us of a day that changed the soul of America forever. It is a day to honor the fallen, their loved ones, and all the heroes who served and protected, and who continue to serve our nation. The lost lives of our beloved families, friends, community members, and colleagues will not be in vain. These victims from the World Trade Center, Flight 11, Flight 175, Flight 77, Flight 93, and the Pentagon will continue to keep the eternal flame of patriotism alive in our hearts. America will be stronger and renewed through the fire of devotion burning in our hearts, homes, communities, workplaces, schools, churches, synagogues, and mosques. In each of these places, America will pray for the repose of the souls of all who were lost on 9/11, and we will stand tall to honor our nation. As we solemnly honor the nearly 3,000 lives lost on that fateful day, let us remain vigilant with protecting our communities and strengthening our homeland. Our vigilance is a tribute to all who perished, so their lives may not be in vain. Each 9/11 commemoration is a time to pause and honor countless heroes who protected others and served victims through inestimable acts of selflessness, compassion, and mercy. These heroes, all who are known by the eyes of heaven, will certainly be rewarded there by their sacrifices, as they represent the heart of America. Those who served on 9/11 and afterwards with acts of kindness, sacrifice, and generosity represent the best of all of us. Our nation will forever honor all who perished on 9/11, and all who served, as well as those who continue to serve including our military. Those tirelessly dedicated to serving our communities, colleagues, and country deserve our greatest respect. Honoring the 9/11 fallen, we must dedicate ourselves to peace in communities across America. Our efforts must be practical with developing violence prevention initiatives especially through enhancing police-community collaboration. Yet, our efforts must also be profoundly spiritual, worshiping as community, and praying from our hearts. We must stand above the anguish of hearts broken by violence, and fill our lives with deeds of faith, hope, and charity. Each person lost on 9/11 was a life gone too soon. The 9/11 fallen includes over 400 emergency workers who were killed on the day of the attack. Although 9/11 changed our mindset with security, one thing will remain forever, our esteem for all who protect and serve, especially those who have offered the ultimate sacrifice in serving others. One of these first responders was a Franciscan priest, Father Mychal F. Judge, killed by fallen debris while ministering to a fallen firefighter. Father Judge, from St. Francis of Assisi Church on West 31st Street in Manhattan, was a chaplain for the FDNY. A photo of Father Judge, being carried away from the rubble on 9/11 by firefighters, police officers, and first responders, remains one of the tragedies most iconic photos. During the solemn remembrances of 9/11 in communities, workplaces, houses of worship, and schools throughout America, let us cling to hope as we honor the fallen. America must have hope and continue to stand tall as a nation of character, compassion, and courage. These virtues represent the heart of America, and will lead us to our rightful destiny as a light of goodness for the world.